The latest update to Evernote brings bug fixes and simple 2016 MacBook Pro Touch Bar support to the popular note-taking and organizational app. Version 6.11 of the Evernote macOS app has added basic functionality to the app for users of the 2016 MacBook Pro with Touch Bar. The additions are minimalist, with sorting by tags for notes, Markup tools for notes for all users and attached PDFs for Premium uses added to the Touch Bar. 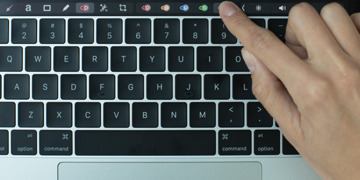 Also added to the Touch Bar is a one-tap note creation button, and a contextual pop-up color picker for highlighting text, table borders, and table cells. Brief AppleInsider testing of the new additions show no appreciable slow-down in app responsiveness or note retrieval on a search of a fairly large note library. Users are reporting that table column widths and row heights are now different —which may alter formatting on some notes. AppleInsider delved into Evernote 8.0.3 for iOS in January and found recent usability improvements welcome, but still needing some improvement. Evernote 6.11 for macOS requires macOS 10.10 or newer and is free on the App Store. The free version is feature-limited, with cross-platform subscriptions running up to $45 a year.